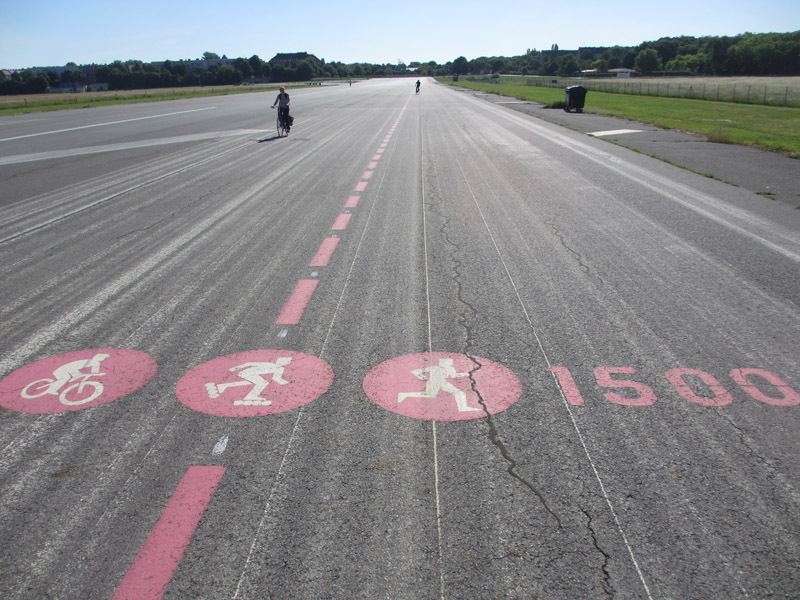 Lately my bike rides around town have included a loop around the runways at Tempelhof in Berlin. I can’t get enough of this former airport turned urban park. Like so many places in Berlin, it is the site of incredible history that in recent years has found new uses in today’s world. Our friends Erwin and Uli first took us to get a glimpse of this park last fall. They live nearby in Kreuzberg, and they often walk over to the park with their sons and their skateboards to take advantage of the long stretches of pavement. The runways have been restored as paths suitable for jogging, biking, rollerblading, skateboarding, or however you like to get around. In between the runways are large stretches of grass, sometimes tended as prairie grass, other sections mowed down for picnicking. In a couple of areas there are community gardens, and people have set out makeshift furniture next to their plots of land, and I’ll admit taking a seat in them a couple of times to rest and enjoy the view. The airport was once simply that, an airport on the edge of the city, but in the 1930s the large open area was used on several occasions as the site of mass rallies by the Nazis. More interesting is how the airport was the primary source of of food, coal, and other supplies during the Berlin Blockade of June 1948 – May 1949, when the Soviets cut off all roads, train routes and canals between West Germany and West Berlin. The Soviets wanted to be the only ones who could supply the city with needed goods. 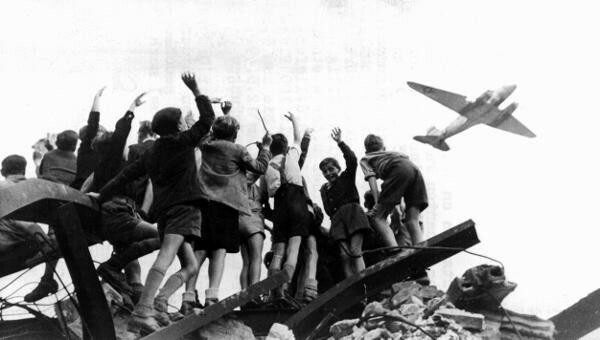 But the western allies rose to the challenge, and within a day organized the Berlin Airlift, the one remaining means of getting goods to the citizens of West Berlin — by air. You can still see one of the American planes used in the Airlift, parked near the airport. I think that much of the good will between Germany and the US stems from this time, when the US (along with British, New Zealand, Australian, Canadian, and South African partners) made it clear they were not going to forget the West Berliners. 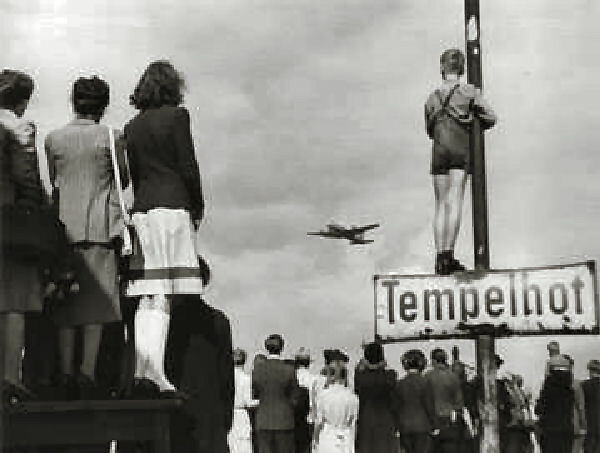 Maybe more than anything the good will came from one pilot’s recognition of the children who came to watch the planes. At first he just handed out the couple of sticks of gum he had in his pocket, but then he decided to make a concerted effort to deliver not just flour and coal but candy for the kids to keep their spirits up. On his next rounds he dropped tiny parachutes made from handkerchiefs with candy attached, and soon other pilots followed his lead. He became known as the “Candy Bomber.” I had read about this on a sign at the grounds of Tempelhof, but I also heard this story from my father-in-law on a recent visit, who told it to me with tears in his eyes. Going above and beyond the call of duty—gets you every time. Here’s a photograph of American soldiers and German civilians celebrating the end of the Airlift, as shown on one of the interpretive signs on the grounds of the airport. 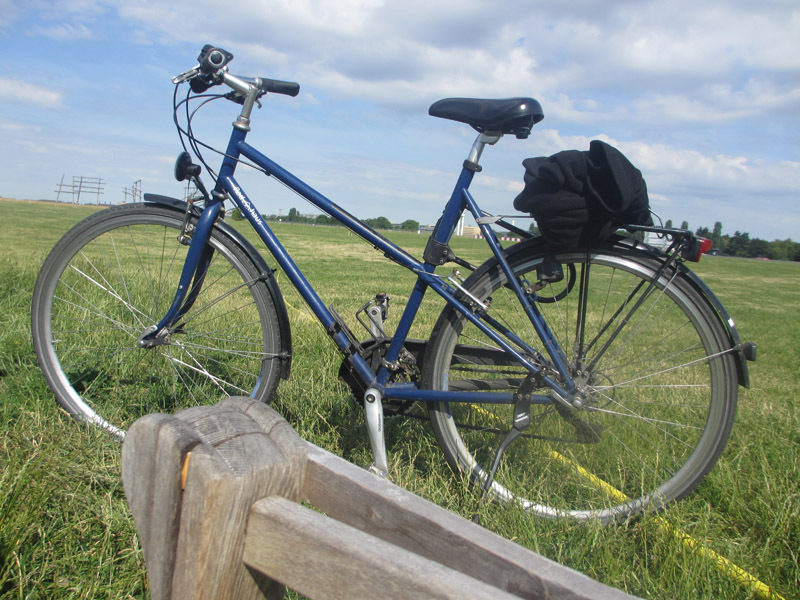 Today Tempelhof is a place for picnics, gardening, exercise, and occasional huge concerts on the open fields. The people who tend the community gardens are pretty creative, putting discarded items to new use as plant containers. A few weeks ago a vote was put to the people as to whether they want to allow some of the vast open tract of land to be used for new housing development. After all, the land is located in Kreuzberg, a popular south-central city neighborhood where many more people would love to live if they could. But the vote came back as a decisive ‘no.’ People want it left as is, at least for the time being. The abandoned airport has already found its new place in the city. I have to include a picture of the bike that brought me here, as seen from my seat in a handmade chair in one of the gardens. A huge thank you to Hanna for the year’s loan, making outings like this possible! 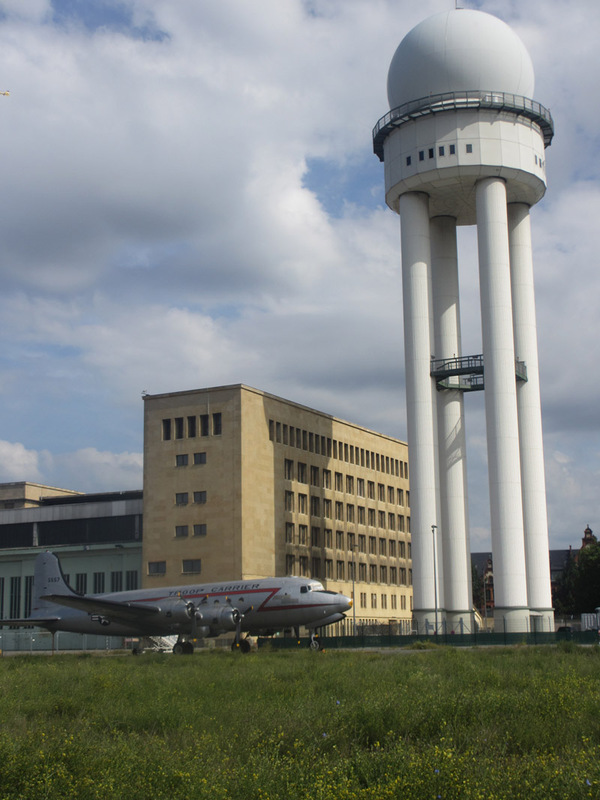 This entry was posted in City life, History and culture and tagged airport, Berlin, Berlin Airlift, Berlin Blockade, Candy Bomber, Kreuzberg, redevelopment, reuse, Tempelhof on June 24, 2014 by Jill M..
you are welcome, Jill. I am glad, the bike got to see so much of Berlin! the bike has been a total life saver. I think the entrance gates are too narrow to get a motorcycle in there, but I see why you say that. Interested in using old shoes as planters. Creative re-use strategy. Agreed! And old boots, handbags… Why not? You will miss the Deutch kitch when you are back in Minni.